Known as one of the seventh new wonders of the world, the Wildebeest migration, where animals cross river Mara, is one of the spectacular views to witness. The World Cup of Wildlife is surely a reasonable name to define the astonishing massive movement of over two million Wildebeests every year. 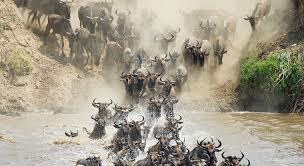 The migration occurs from The Serengeti National park in Tanzania to Maasai Mara National Reserve in Kenya. 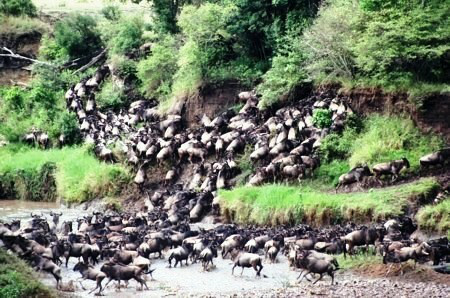 This vast migration occurs between July and October as the animals move to a new wildebeest habitat in Kenya. The main immigrant animals are the Wilde Beast, Thomson’s gazelles, Zebras, Elands, and others. In the real sense, there is no obvious time when the wildlife migration occurs. The migration is quite dynamic and can happen at two different times in two consecutive years as the animals search for food and water. This poses as a tourist attraction for tourists who come to venture this amazing wildlife habit in Kenya and Tanzania. The Wildebeest migration in Kenya has boosted its position as a major tourist destination. The most popular places include the Maasai Mara Game Reserve, Coastal beaches and luxurious hotels in different parts of Kenya and Tanzania. There are four different seasons and weather changes per year that influences the Wildebeest migration process and timing. This spans from the short dry season between December and February/March, long rains between March and May, long dry season from June to September and finally the short rains from October into November. However, with the global climate change, it has the weather patterns have become uncertain and do not follow a specific timeline as it used to be a few decades ago. The start of each year welcomes the calving season of the animals. Usually, there are about 400,000 calves born within two to three weeks period. This happens in the short-grass plains spreading over the lower northern slopes of the Ngorongoro highlands and scattering around the Olduvai Gorge. It is estimated that the wildebeest have grazed around this area for over a million years. The birthing time provides a big opportunity for predators that are always on the lookout when the young ones are born since the animals are weaker. However, due to the short time, the animals only have a limited time to take advantage of the situation. But the predators are also not so lucky because the Wildebeest calves can get on their feet and outrun big enemy animals two or three minutes after birth. As such, about 99 % of the calves may survive. Separation of the calf from its mother can occur mainly during a panic and when the wildebeest loses the calf it can’t adopt a strange calf. The lost calf easily becomes a victim for the predators. At the end of the short dry season around March, the wildebeests start their migration heading towards Kenya as they seek for fresh grazing grounds and water. This will largely depend on the weather, which often dictates which direction to take. But most of the times, the animals end up in central and western Serengeti. These animals are quite incredible as they go towards areas with new grass, which is usually on the western woodlands where they also get water from Lake Ndutu and Lake Masek. When it starts raining, the wildebeest migrate away to a distant place away from the heavy rains and floods. During the rut, the wildebeests head North West into the woodlands of the hilly country West of Seronera toward Lake Victoria. It is here where about half a million population mate in less than a month. The males usually fight one another during this period as they compete for the females. However, this does not lead to serious injuries. From the Western Serengeti, the animals head north into Kenya and the Maasai Mara Game Reserve. This coincides with a new season from June to September. The animals cross several rivers on their way to Maasai Mara. Crossing some of the large rivers is usually a challenge especially due to the large water volumes, speed and not forgetting reptiles such as crocodiles. Although the wildebeests can divert or use other safer routes or go to other grazing fields, they always use this same path despite its dangers. In particular, crossing the large Mara river has become one of the major attractions. This is because Mara River is quite wide and infested with gigantic crocodiles. First, wildebeests will gather on one side and then find a suitable crossing point. This will also provide them with an opportunity to familiarize with one. it is not only the wild beasts that know about the event of crossing the Mara river. In fact, this gives the predators an opportunity to feast on the wildebeests. This includes animals such as lions, crocodiles, and others. Despite the dangers posed by both land and water predators, a good majority of the wildebeests manages to safely cross to the other side. The wildebeest will then spend several months consuming pastures in Kenya. These animals are very good in finding good grazing areas as well as quickly adapt to new environments. This saves time as the wildebeests will also mate while on the move. In addition, predators cannot keep up with the wildebeests lifestyles of always on the move, something that works to wildebeests advantage. In October, the first phase of short rains starts, enabling the growth of fresh grass in the Serengeti. At the same time the wildebeest start again to move South through the Eastern Woodlands of the Serengeti. At first they are usually in a large group but often dispers as they reach open plains. The wilde beat migration is a wonderful experience in which over two million animals move in a group as they search for greener pastures. The movement covers a total distance of about 240Km every year. As the animals move from one place to th other, where they encounter a wide range of challanges including predators such as lions, chrocodiles and others. The best thing is that most of them are able to survive and continue the migration process. Wildebeest migration in Kenya and Tanzania is a major tourist attraction for the two countries. This is in additon to other attractions such as good beaches, hotels and other. Other than this, Kenya has become a major destination for conference tourism over the last few years, providing visitors with the opportunity to combine business and leisure.